Think of European palaces and you obviously think of delicate facades, dramatic fountains, lofty spires, lush tapestries, timeless works of art, and, of course, tropical butterflies. 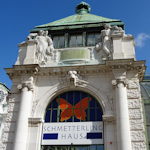 The Imperial Butterfly House (German: Schmetterlinghaus) is a converted palm house at the edge of the Burggarten park, sandwiched between the Neue Burg wing of the Hofburg palace complex and the Albertina art museum. So it offers a short, but colourful, distraction should you ever grow tired of monuments and Monets. Architect Ludwig Remy built the first greenhouse on this site in the 1820s. This was replaced at the start of the 20th century by the current Art Nouveau palm house that now houses both the butterflies and a neighbouring cafe. The new building was part of the extensive refurbishments in and around the Hofburg palace that came to an end with the emptying of the Imperial purse and the fall of the monarchy. While the royals of the time may have enjoyed the warmth and plants, there were actually no exotic butterflies to delight the Imperial grandchildren – the butterfly house opened in 1990, settling in its present form in 1998. The butterfly house isn’t huge – it took me about 100 paces to circle the hothouse – but it’s thick with tropical trees, shrubs and flowers, a small waterfall and even a raised platform to get you above the vegetation. Blues, reds, oranges, greens, blacks and yellows flit and flash across your vision. A few of the species on display breed naturally – the rest come from breeding programmes on butterfly farms (so no wild or endangered butterflies are involved). The tropical butterfly poster at the entrance didn’t seem to match the actual residents, but there were certainly owl butterflies and I think I identified blue morphos, flame butterflies and longwings among the many other species. I didn’t see one on my last visit but, on a previous visit, a giant model moth turned out to be a real Atlas Moth: its wingspan can exceed 25cm. At the time of writing, entrance tickets were €7 for adults, with the usual concessions. The butterfly house opens all year round from 10 am, closing between 3.45 pm and 6.15 pm, depending on the day and season. Do check locally for up-to-date information, though. Look for the feeding tables and honey-coated artificial flowers where you can watch butterflies at rest. Just sit quietly on one of the chairs, relax and take a break from sightseeing stress. The butterflies will pass by and stop on nearby plants – enjoy a moment of tranquility, particularly when one delicate creature shows enough trust (or foolishness) to land softly on your head. Treat the vegetation like one of those 3D images where you have to refocus your eyes to see the picture. Suddenly you’ll notice that colourful butterfly sitting perfectly still just a hairbreadth away. There’s a small shop integrated with the ticket office, selling toys, books, puzzles, t-shirts, jewellery and similar (no prizes for guessing the common motif). At the back of the shop are some racks where you can leave your coat to avoid overheating – the butterfly house is obviously warm and humid, and your camera lens will mist up initially, especially if you visit in the winter months. Like many of the attractions in the Hofburg palace area, this one is only reachable on foot. But it’s very central and close to various stations and stops.